WizardSync For Backup- Why Is It Preferable? How would you feel if the data that you have on your PC was lost for some reason? It can prove to be very frustrating, especially if the documents are important. Sometimes, it can also cause financial problems for individuals. In this case, wouldn’t it be a good idea to have backup? Apart from that, you may also make constant changes to the files that you have on your computer, which you may have also saved on other locations like external devices or different partitions. In this situation, people need to have a utility that can perform this task on its own. The answer to both these problems can be found in the form of WizardSync, primarily a backup software. Launched in August 2014, this application has been designed to aid people in keeping their folders and files in sync with one another effortlessly. It accomplishes this task by performing automatic processes that can update the files and folders every time their content is changed by the user. Moreover, the software can also provide people with excellent backup by spreading out the documents in a number of partitions or by storing them on removable devices like external hard disks and USB flash drives. Furthermore, it is possible for people to carry out this operation in both ways i.e. from the USB drive to the computer. However, people will need two separate locations in order to execute this plan, which can be complete folders or even drives that contain the desired documents. In case people wish to use more than one plan, it is possible to use a custom name to easily differentiate between them. 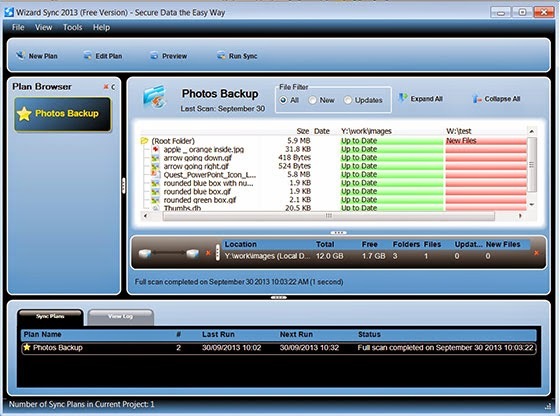 Creating backup plans is also one of the most significant functions of this software as this can provide people protection from accidental deletion and file corruption. Similar to the sync plan, people need to choose the files and the output directory. They also have the option of including hidden and system files. Apart from that, if people don’t want to copy off entire folders and wish to exclude some files, the software allows them to choose the ones they want to keep and remove the ones you want to exclude. Hence, WizardSync can prove to be a handy software when important files have to be backed up. People don’t have to be worried about their files being stolen or compromised, as the software provides the option of using password protection for keeping the files secure. The performance of this software is exemplary as it can easily handle large folders and lots of files. The software is extremely user friendly and can be used by people easily, even if they don’t have any technical experience. One of the best part about WizardSync is that it can be downloaded free of cost. The software is available for free so individuals don’t have to worry about having to pay a huge sum for purchasing it or dealing with subscription charges and still keep their files safe and backed up in case of any unfortunate incident.